Emerging media narratives suggest that with smartphone sales contracting in many markets globally, there will increasingly be less opportunity for Apple to sell its high-end, ultra premium iPhone models to new buyers. But the reality is that Apple has a vast installed base of iPhone users-- and across the last year, while Apple earned incredible billions selling iPhones, only a small percentage of those users have yet upgraded to its newest, high-end flagships. Regulatory filings in China have revealed a number of interesting details about Apple's newest iPhones, including that the iPhone XS and XS Max both use 4GB of memory, and while the iPhone XS Max and XR have larger batteries than the iPhone X, the iPhone XS uses a smaller capacity power source. Although much of its media hype has been focused on the iPhone XS and XS Max, Apple is reportedly planning to boost production of the iPhone XR past the 50 percent ratio by December. It is likely that people upgrading their smartphone to the iPhone XS, iPhone XS Max, or iPhone XR may want to take advantage of the wireless charging functionality offered by them all. AppleInsider highlights some of the best Qi wireless chargers available on the market to power your iPhone XS, XS Max or XR. Financial blogs are taking seriously an early claim by a Rosenblatt Securities analyst who says he's discovered that preorders of Apple's new iPhone XS and XS Max were "weaker compared to iPhone X preorders" a year ago. Reports have failed to note, however, that analyst Jun Zhang was wrong last year, too. Apple's insistence on custom design of chips like the Neural Engine in the iPhone XS, XS Max, and XR is about unchaining the company's other designers, according to the lead of its chip architects. The iPhone XS and XS Max, which ship this week, as well as the forthcoming iPhone XR support certain NFC card transactions even when iOS is not running and the host device is powered because it needs to be charged. Apple CEO Tim Cook is making the media rounds following last week's iPhone XS, XS Max, XR and Apple Watch unveiling, with the executive scheduled to talk up his company's new devices on ABC's Good Morning America. Breaking down first weekend pre-order sales of Apple's just announced iPhone and Apple Watch products, noted analyst Ming-Chi Kuo believes current shipping estimates and launch day supply bode well for iPhone XS Max and Apple Watch Series 4. Demand for the 5.8-inch iPhone XS, however, appears to be lower than expected. If you have an iPhone X, should you upgrade to the iPhone XS or iPhone XS Max? Preorders for the iPhone XS and XS Max have just commenced, and some may be wondering if it's worth ordering one if they already own an iPhone X. It's a question AppleInsider has been asked a lot, so let's talk about it. 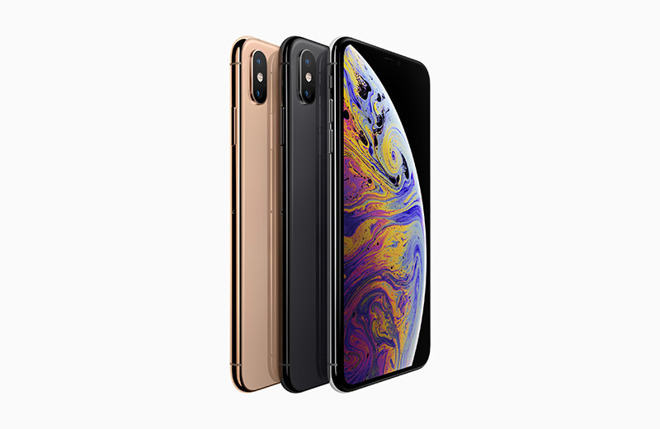 Apple finally swung the hammer this week, introducing the iPhone XS, XS Max, and XR, as well as the Apple Watch Series 4. We also found out when the company is set to release iOS 12, tvOS 12, watchOS 5, and macOS Mojave. The AppleInsider Podcast examines the details behind the releases of the iPhone XS, iPhone XS Max, iPhone XR and the Apple Watch Series 4: what Apple didn't tell us and how you can choose between the models. The iPhone XR versus the iPhone XS and iPhone XS Max: Which is right for you? The iPhone XR's launch yesterday revealed it to be a value proposition for those wanting to buy one of Apple's 2018 iPhone models, giving the vast majority of features found in the iPhone XS models but at a lower cost. AppleInsider explains the main differences between the latest models. Apple has updated Core NFC, the iOS system used to perform NFC-based transactions with apps, with the change now allowing for tags that use the technology to be read by an iPhone XS, iPhone XS Max, and iPhone XR without requiring the user to open a relevant app beforehand. Apple says the new iPhone XR offers battery life of 1.5 hours more than the iPhone 8 Plus, making it the best ever. AppleInsider takes a look back at similar claims Apple has made about the product line in the past. Although the cost of the iPhone XS Max may be prohibitive for many people, Apple is trying to cater to a wide range of customers, CEO Tim Cook said in an interview published Thursday. There are a lot of possible screen sizes for the iPhone. AppleInsider shows you exactly the size of the iPhone XS, iPhone XS Max, and iPhone XR -- and how they compare to other recent models. Last year, Apple introduced a 'revolutionary' new iPhone X as if it were a futuristic concept car-- alongside the more typical, incremental advancements of iPhone 8. The new X was intended to show off Apple's vision for the future of mobile devices. This year, that future arrived and expanded to become the new normal, fully exploiting Apple's lead with the front-facing 3D TrueDepth camera. With just a few months left to go, the iPhone XS, XS Max, and XR are nevertheless predicted to beat 85 million units by 2019, according to a new research estimate. Apple's AirPower is in stealth mode, as the company has mostly scrubbed it from its online presence. The technology is hard to perfect, and is much more than it appears at first glance -- AppleInsider tells you why.